Divide dough in thirds; wrap each third in plastic. Chill for at least 1 hour or overnight. Before rolling out, let sit at room temperature for 5-10 minutes. Place a dough third on a large piece of lightly floured parchment paper or wax paper. Using a rolling pin, roll dough 1/8 inch thick. Refrigerate again for 5-10 minutes to make it easier to cut out the cookies. Use a four-inch gingerbread man cookie cutter to cut the dough. 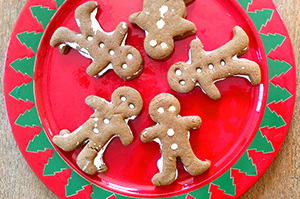 With a small plastic drinking straw (1/4 inch diameter) poke holes in half of the cookies where the buttons and eyes are commonly found on a gingerbread cookie. Transfer to ungreased baking sheets. Bake until crisp but not darkened, 6 to 8 minutes. Let sit a few minutes and then use a metal spatula to transfer cookies to a wire rack to cool completely. Spread the marshmallow crème on the backs of the cookies with the holes in them, making sure the crème gets into the button and eye holes. Make a sandwich by placing the cookies with the holes in them on top of the cookies without.